How do I know what mission trip or organization would be best for me? Where in the world should I go? Should I go with Baylor Missions on a trip? These are all valid questions to ask as you start to think through what you want to do this Spring Break, May Mini-Mester or summer. 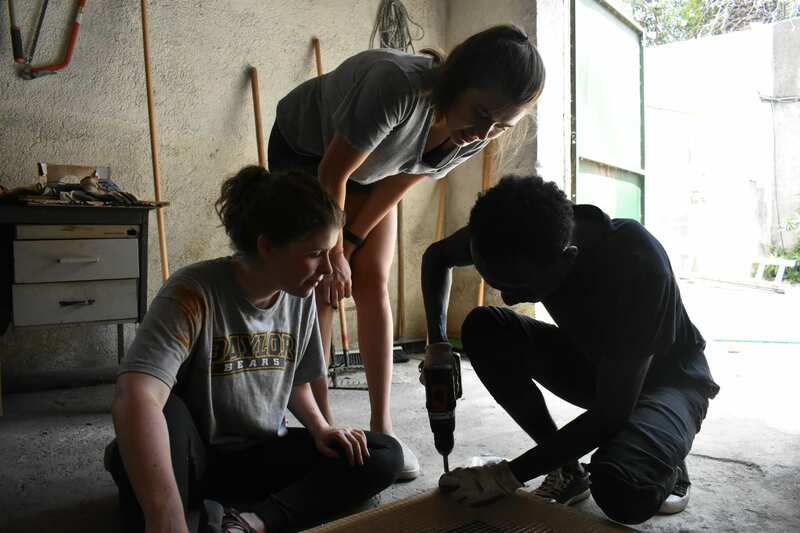 As we get closer and closer to the rollout of Baylor’s 2018-2019 Mission Trips in October, we wanted to give you some ideas to think through when you’re trying to find your best missions fit! 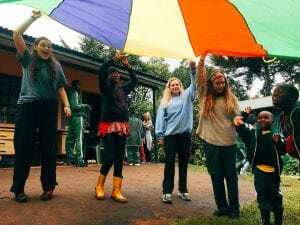 Picking a mission trip through Baylor or another missions sending organization can be intimidating but here are some questions to consider that can help you find the right spot. 1. What do I know about this mission organization? Research is important, y’all. Before going anywhere with an organization/team (including Baylor! ), it is important to make sure your beliefs and values line up with that team/organization’s beliefs, values, and purpose. Take a good look at the organization’s website and read about why and how they do what they do and see if that resonates with what you believe and want to practice through service alongside them. If you’ve never thought about your own missions philosophy, talk with your church to see what they espouse OR reflect on what you think the importance & purpose of missions before you start applying. If you think it’s a good fit on that deep level, then it’s time to check out more of the specifics: Where do they go? Where would I stay? How long would I be serving? What would I be doing? Is it a team of people or would I be by myself? Organization websites are a great place to start learning all this, but even better would be to TALK to someone! Call their office–speak with a recruiter and ask them for contact info for a student who’s been on the trip before to get a 2nd perspective on what the experience is really like. If you’re talking about going on a Baylor Missions trip, reach out to the team leader listed on the team website for more info or attend an interest meeting to learn more. Baylor Missions staff and team leaders can also connect you with other Baylor students who have served in the past and they can mentor you through the process. 2. Is there a part of the world I feel called to? Some students feel called to serve in specific areas of the world. God calls us all in special ways but it’s important to reflect on what’s motivating you towards one part of the world or another. Many students just have a love of a language or global culture that they want to be a part of ministry in that part of the world–we think that’s awesome! As you’re researching organizations, take note that many missions organizations focus on specific parts of the world. If you feel called to Asia, begin looking at mission organizations that focus in Asia. If you feel called to use your Spanish & medical skills, check out organizations that serve in Central and South America with a medical focus. Baylor Missions provides a wide variety of places that you can serve around the world and we partner with organizations that love to see students engage their passions and skills with the local communities. Prayerfully consider where & what God is leading you to! 3. Will they help me prepare culturally? Before you serve in a new community, you need to understand that community. No matter where you’re going, domestically or internationally, or even just serving around Waco, the culture of the people you’re serving will likely be different than your–and that’s a great opportunity to practice cultural humility! Sometimes, we don’t even realize what habits or values we hold that are actually cultural (to the U.S.A or to our hometown even) until we meet someone who grew up somewhere else and may see the world in a different way. Missions gives you the opportunity to explore new cultures and ask questions of yourself and others about culture as you build relationships with others. Be open to sharing about your culture, and at the same time be a GREAT LISTENER to consider the perspectives of others and how their communities have helped shape who they are. Many times, you realize that you’re not so different after all. As you’re seeking out missions opportunities, find a team that is intentional to provide resources and trainings about how to serve well in a new culture. At the same time, YOU need to be preparing yourself to be respectful in new environments–thinking about how you dress, speak, relate to others. 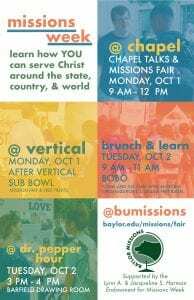 There are lots of great Baylor resources to help you with that like the Baylor Missions Summit OR you can reach out to Spiritual Life, Multicultural Affairs, or the Center for Global Engagement to learn about on campus events and trainings that can connect you to students from those cultures or help you become more culturally savvy! 4. Will they help me prepare financially? Fundraising is a big aspect of preparing for a mission trip. Will this organization help you fundraise by explaining how to reach different kinds of people in your life and helping you set goals? Do they provide any financial assistance? What kind of technology do they support that could help you fundraise easier? This can be a big stress before a trip and finding an organization that will support and encourage you can make a big difference. At Baylor Missions, we have a “Support Raising 101” event multiple times a year to help students learn about effective fundraising and we also have the opportunity to provide students with financial supplements to bring down the cost of trips through the University. The biggest thing about support raising is making sure that your family & community are behind you. Think about the people in your life who would be super excited to support you, whether with their dollars or prayers, and give them an opportunity to bless you and the community you’re going to serve. Get creative and be faithful–it’s definitely a faith building experience! 5. Does this mission organization have local partners in the community they’re serving? Community partners are ESSENTIAL because they ensure that the work you’re helping with will be sustained even after you’re gone! Community partners will also help you to be sure that the work you’re doing is meaningful and necessary for the community. Community partners know the needs and skills of their neighbors. 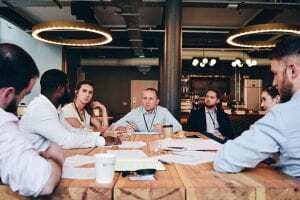 They know what types of projects and partnerships are EMPOWERING to them, and they also know what things might HURT the community–like by taking away work opportunities for locals or creating systems of dependence on foreigners instead of building up self-sufficiency. Healthy missions organizations and partnership have locals on board in organizational leadership and decision making. Take this opportunity to learn from local leaders in the culture you’re immersed in. They have a wealth of cultural knowledge and a passion for seeing their communities thrive. It will greatly impact the way you view the community and how you can better serve alongside them. 6. How will this trip fit into what I’m learning in my classes? There are so many organizations doing different things in the world, find one that fits into what you’re learning! Some organizations teach English, build homes, run sports camps, teach music classes, use marketing and entrepreneurship as tools, tons of medical mission organizations, advocate for people in poverty by influencing public policy, and so much more. There is a way to bridge what you’re learning in the classroom into how you will serve through missions. Find your passion within a mission organization instead of trying to fit into something that doesn’t work for you! God has giving you talents and skills and a heart to serve using those things you’re really good at. When you’re serving from your strengths and vocation, you’ll see a greater impact–on yourself and others! We know you’re not an expert (yet) in small business development or neuroscience…but it doesn’t mean that you haven’t learned some basics that you can build off of by challenging you to think about what your discipline can bring to solve global challenges. If anything, going on a discipline-specific trip may increase your motivation to go deeper into your area of study OR change it all together lol Think of missions as a learning laboratory–don’t be afraid to take chances and find creative ways to partner with others to think up complex solutions to complex problems. 7. How does Baylor Missions fit in? Baylor Missions focuses on Faith and Service in the Discipline-Specific setting. We collaborate with faculty & staff from a variety of disciplines & backgrounds along with our global partners in order to implement spiritually rich & challenging experiences for you, Baylor students. It is our hope that you would not only enjoy the experience (which is important), but also discover a sense of vocation & calling as you see first-hand how they can use their discipline to serve. Baylor sends over 700 students on 50+ trips each year. Mark your calendar for Global Missions Interest Meetings on October 8th and 9th , at 5pm at the Bobo, where you can learn more about our 2018-2019 trips and what the application process is like. Also, check out www.baylor.edu/missions/global for more info! ALL Trips go live on October 1! 8. Where can I learn about a variety of mission organizations? What if Baylor isn’t going to Nepal…or you are Pre-Dental and really want to go work in dentistry clinics and that’s not an option..NBD friends! Baylor Missions WEEK is the perfect place to learn about a whole bunch of different mission organizations. On October 1st & 2nd, 2018 we have 30+ mission organization coming to our campus to engage with you! These organizations will be diverse, working all over the world in all kinds of different disciplines. Be sure to check out the events Monday & Tuesday! Note all the free food! Questions like “Where will I spend next summer?” can feel big and intimidating but when you’ve done the research and know what questions to ask, finding your fit can be as simple as showing up to Missions Week or going to an interest meeting! Are there any other questions you think could be important to ask? Kathleen Post is the Ministry Associate for Global Missions and a student at Baylor’s Truett Seminary. Culture Shock: What is it?